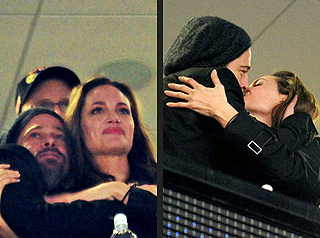 Dispelling rumors while cheering on the Saints, Brad Pitt and Angelina Jolie got cozy at the Super Bowl. The couple showed their love for New Orleans and for each other during a historic and victorious night for one of their favorite cities. Although they brought son Maddox along, Brange managed to steal a few kisses. How sweet!